Fully covered in imitation leather, the streamlined Hype dining chair boasts an inviting shell molded to hug the body. Inspired by the mid-century modern aesthetic, the Hype dining chair offers an inviting seating experience with a shell molded to organically hug the body. The shell, fully upholstered in imitation leather, is adorned with topstitch detailing. 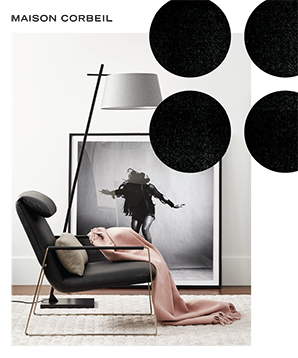 With a black metal base, the Hype chair is offered in a variety of colours, from neutral tones to accent pops of colour. A Maison Corbeil exclusive, the Hype chair is suitable for both dining room and office, thanks to its ergonomic comfort.